Listen to her testimony (in English). She evacuated from Tokyo to Kobe in west Japan to protect her daughter. The contamination does not stop at the Fukushima department border. Tokyo is also contaminated. I am standing here to tell you that the Fukushima nuclear catastrophe is not over. I evacuated to Kansai (note2), three years after the Fukushima nuclear power plant accident. Where do you think I evacuated from? Tens of millions of people in east Japan live with radioactive contamination now. I have a daughter who was 5 years old at the time of the accident. She became very sick one year after the accident. However, when she stayed in a place where there was no radioactive contamination, my daughter became so well. But when we returned to Tokyo, my daughter became sick again. We did not have the option to stay in Tokyo, we just fled from Tokyo and came here. Living in east Japan means living with many radioactive materials, and it is not a place where people can live healthily. We are calling for evacuation to west Japan. We are evacuees from eastern Japan. Our existence will not be broadcasted on radio waves or published in newspapers. So, I am telling you about it now. After the accident, we were told that radiation was not a problem, health damages would not occur. Many of us have evacuated from east to west due to various health problems. Many people are getting sick today in east Japan. People are dying without noticing that it is due to radiation. Many Japanese can not face this nuclear catastrophe. Please try to know what is going on in Japan now. We are telling the world that the nuclear disaster is far from being over. Note 1: We thank Ms Yoko Chase for her proofreading of the text prepared by Ms Yoko Shimozawa. Note 2: The region in west Japan, including large cities such as Osaka, Kyoto and Kobe. The result of analysis of a cartridge filter of shower water using essentially zeolite. The user lives in Funabashi city in Chiba (near Tokyo). The period of use is from Feb 2017 to August 2017. The volume of water used is about 52500L. While taking a shower, one is exposed to a high risk of inhaling cesium contained in the steam. Radioactive Contamination from Fukushima Nuclear Disaster: Did You Know that Tokyo Metropolitan Area is Widely Contaminated Too? We are “GO WEST & COME WEST!!! 3.11 Evacuees from Tokyo area”. Etsuji Watanabe, one of the members of Association for Citizens and Scientists Concerned about Internal Radiation Exposures (ACSIR), estimates that each year at most 180,000 people may develop cancer and 90,000 will be killed by cancer or some other causes. Estimation of the risk for 10 million people in Tokyo Metropolitan area exposed by radiation (2.4mSv/year). Data provided by Mr. Kirishima. ** According to a book ‘Chernobyl: Consequences of the Catastrophe for People and the Environment’ by Alexey V. Yablokov, ratio of death caused by cancer and not by cancer is 1 to 1. The child thyroid cancer which were commonly seen after Chernobyl accident is being found even around Tokyo area after several years from 3.11 Fukushima accident in 2011. Severe illness such as various cancers, leukemia, and cardiac infarction are increasing too at alarming rate. For some people, immune system has also weakened due to radiation effects, and the conditions of their chronic disease or common cold are worsening. Therefore some people from Tokyo have evacuated to safer places. However Japanese government (and main media) continue to ignore the effects of Fukushima radiation even though the radiation level is still dangerously high. The government have recently lifted evacuation orders for the restricted residence areas and cut housing subsidies for evacuees, forcing them to believe it is safe to return. Therefore some people think it is nonsense to evacuate from Tokyo area and believe the evacuees are over-reacting. Many of the evacuees are feeling very isolated and are living in poverty after moving to safer locations, forcing some to return to the contaminated area against their will. About 45 million people still remain in contaminated metropolitan area in Tokyo. But many people are started feeling very ill one after another. In fact many of my friends living in Tokyo or Eastern Japan have collapsed from numerous illnesses over these years. It has proven that an increase of serious illness was seen four-to-five years after 1986 Chernobyl meltdown and hundreds of thousands of people lost their lives. Now we are facing the same situation in Tokyo and eastern Japan. Fukushima radiation problem permits no delay. We need to encourage people in Tokyo and Eastern Japan to evacuate to safer places to protect their lives. 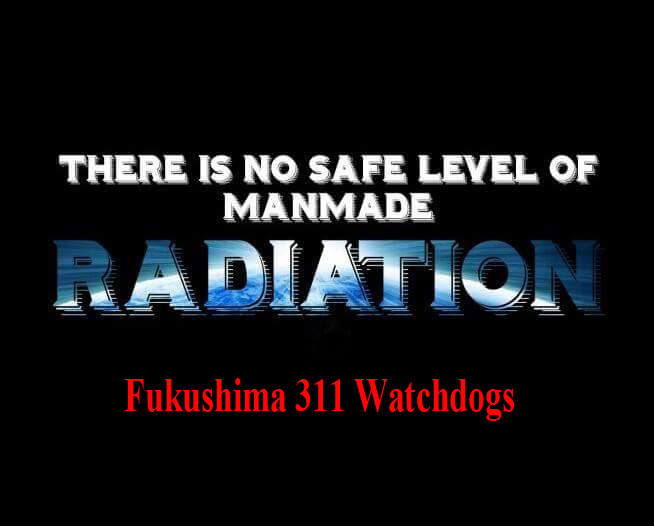 In order to fight against the inhumanity of the Japanese government toward lives of people and uncover the fact of radiation effect in Japan, it is urgently needed to spread the information like this to the public. A Japanese local magazine gives the list of prefectures where Cesium 134 and Cesium 137 have been detected in their tap water ! The left column gives the name of the prefecture. The central column gives the Cesium 134 detected and the right column the Cesium 137 : in white with three Chinese characters reads “not detected” while in black the white figures indicates the level of bq detected. The third line from the bottom is Tokyo. Cesium 134 and Cesium 137 have both been detected in its tap water at high levels!